I think my GPS cut the distance a little as I forgot to turn it back on once …. should be about 168 kms. Wow, one of the toughest days ever on a bike. 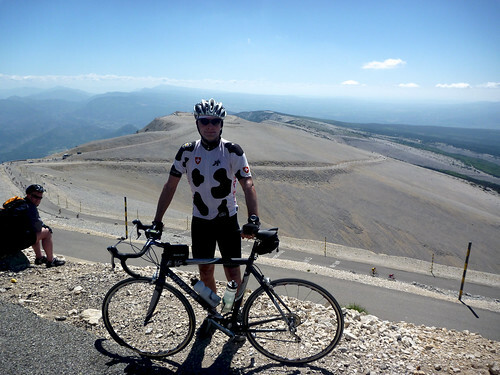 My good friend Philippe and I braved the heat (32 Celsius) and the slopes of Ventoux for a difficult but ultimately satisfying day. Really fun. 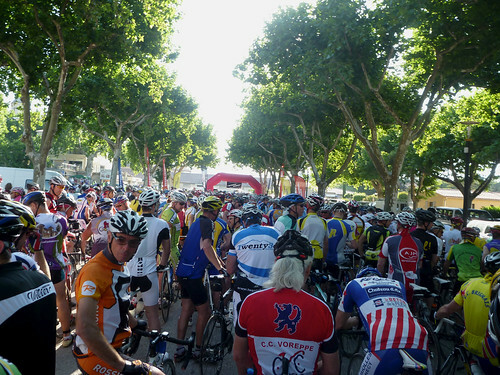 A terrific and challenging cyclosportive run by the same group as La Marmotte. 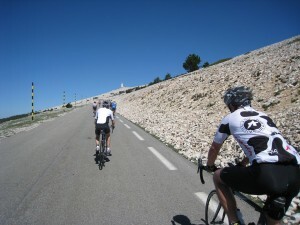 With a route including the “famous” way up Mont Ventoux. 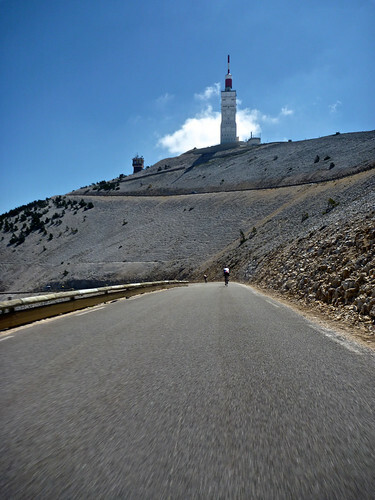 Luckily, the toughest part of the day was early: the ascension of Ventoux from Bédoin. This is the 4th time I have climbed from this side, and easily the best I have ever felt. The weight loss pays dividends on something this steep. Given the heat, I followed my usual strategy of eating and drinking like a pig all day. 😉 12 water bottles and enough “cake” to make me feel a little sick – but at least I avoided a food bonk. 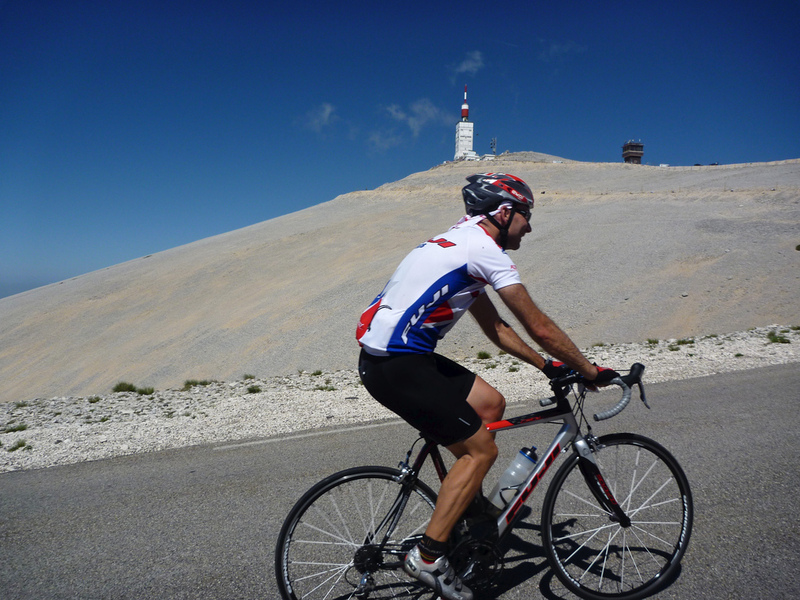 Luckily, despite the effort, I remembered to “take it all in.” The top of Ventoux is just a special place. Cyclists everywhere, views to die for, and the unique lunar landscape. We were in no rush and half way through with no end in site, we even stopped for a much needed Coca Cola break at a scenic café. The second main climb, from Sault to Chalet Reynard is long but fortunately not steep and we made slow progress but were both thrilled to reach Reynard and the descent back down to Bédoin. 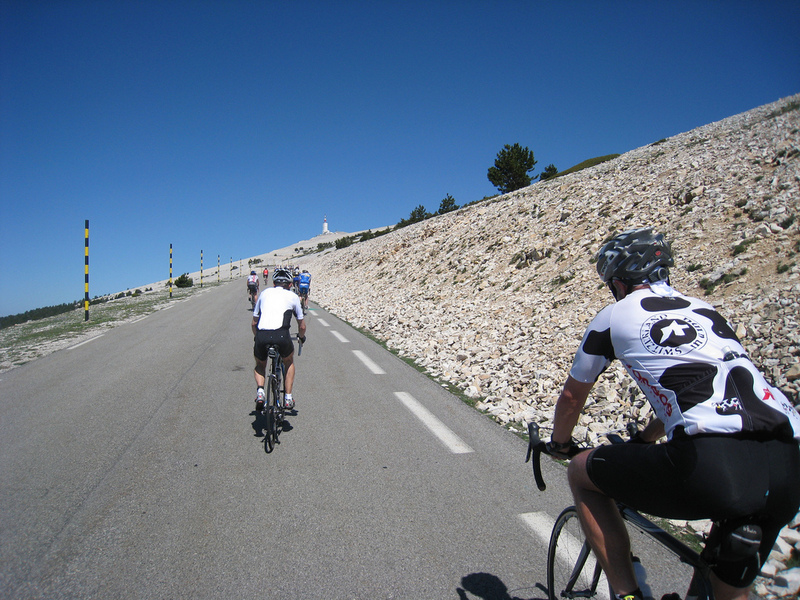 In 2008, I did the Routes des Ventoux Cyclosportive which climbs the Maulacène side – details here. It runs again September 12th, this fall. But we weren’t done yet. In the elevation profile above, you’ll see two tiny bumps at the end (Col de la Madeleleine and Col de la Chaine). They look tiny, but after too many hours in the heat, they were scenic but hard work. 😉 Of course we stopped for photos at all the Col signs (see last pic). I speak ok but not great French. Philippe patiently helps me improve and we always talk in French ….. but after several hours in the heat, I start babbling nonsense. Je m’excuse! Finally, the last 7 kms were all down hill and we were greeted by my biggest (only?) 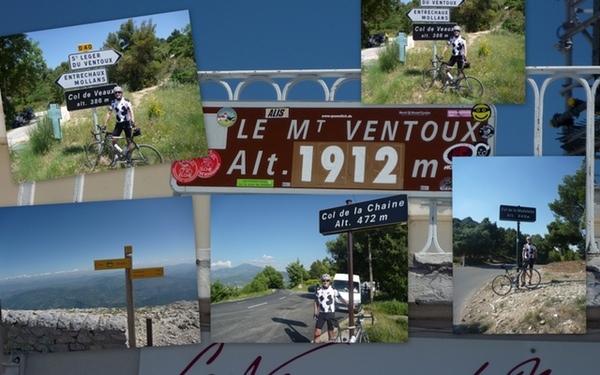 fan – my wife – who had herself climbed the entire classic route from Bédoin to the top of Ventoux (chapeau!). All-in-all a tough but great day. 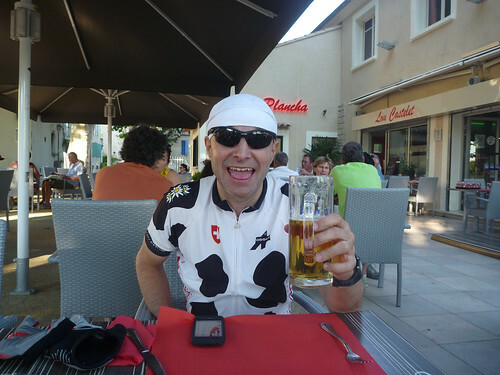 And yes, I enjoyed the post ride beer(s). Maybe you’ve already answered this question somewhere, but I wanted to know how many times you’ve climbed Mont Ventoux (especially since you write that it was the fourth time from that side) and the other famous (those that features in the the Tour, Romandie, Suisse, Dauphine, etc.) climbs. 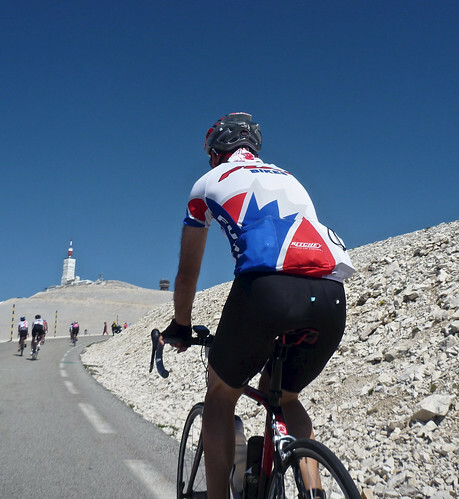 A few times, I love Ventoux and have done all three sides – it’s an easy drive from Geneva. Other stuff, how often? Who knows? But if it looks fun, I’ll give it a try. encore un grand merci pour avoir partagé cette journée, et m’avoir aidé dans la difficulté. une cyclo qui restera dans ma mémoire !! Bravo à tous les (t)rois (et vos petites reines). happy to see you again and I hope it’s not the last time. I’ve written a few words about our day and transfered it to Philippe : just ask him if you want to read it and he will send it to you. J’ai lu votre compte-rendu. Félicitations pour votre performance impressionnante. Congratulations Will. 168 kilometers up and down with more than 30° C is a great performance. 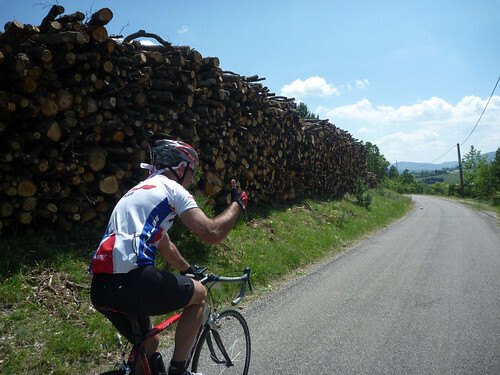 My longest ride with this kind of heat was…62 kilometers (including the Mont du Chat…quand même). I hope you’ll have a great biking season !